A national disgrace, scoundrel and extremist*: Objection Grounds for 500 houses and visitor accommodation at Menie. This post is an attempt to guide objectors as to how to object to Trump's latest planning application at Menie. In short, he is proposing to, rather than build the resort in phases alongside profitable residential development, to just proceed with building the houses. That URL will also give you access to the application and comments lodged thus far. You have until 11th October only to make comment. 3. Add any further detail you wish : maybe pick an aspect of the whole that particularly resonates with you. 4. Refrain from simple abuse of Mr Trump but if there are elements of his past behaviour that illuminate issues with a linkage to planning matters or material considerations, please do mention these. Edit: Reference in the first draft here to 'misogynist, racist and downright boorish Mr Trump' seems to have resulted in an objection being rejected. Please be very careful not to include such comments. The original proposal (2006/4605) was approved by Scottish Ministers but strict phasing to ensure that the (profitable) open housing was only delivered alongside the development was set out ‘In order to ensure the implementation and completion of the golf course resort components of the proposal, as these are the elements of the proposed development which the planning authority considers will bring economic and social benefit to the area. This application seeks to circumvent all the conditions and agreements of the original planning permission, bringing the building of mainstream housing first, removing the incentive to develop the resort in phases. It also replaces the existing Masterplan which was agreed with Aberdeenshire Council in 2010 with ill defined ‘Chapters’ of development. Further it seeks to renegotiate or avoid the agreed package of required infrastructure development associated with this significant development. The current Section 75 agreement includes provision for sewerage upgrades, primary school provision, community facilities (including a general store to serve the development), new junction onto the A90(T) dual carriageway, and affordable housing. All these elements are at risk if the developer is allowed to avoid the implementation of the current Section 75 legal agreement between itself and Aberdeenshire Council to the massive dis-benefit of existing communities. The applicants claim this is necessary as the development is otherwise unviable. The resort at it stands employs 90-95 people and makes a small operational profit. Significant losses are however posted annually due to ‘Administration and Management Charges’ amounting to a third to a half of turnover. This ensures a tax loss. This application is claimed to increase direct employment on site by around 80: this is paltry in comparison to the initial claims which underpinned the 2006 permission and is certainly not grounds to depart from the principles of the permission. While economic circumstances are different from those in 2005/6 when the scheme was conceived, a more major factor impacting the viability of Trump Organisation businesses, including this one, may be the increasingly toxic nature of the brand with resorts, properties and hotels worldwide being rebranded away from the name Trump to avoid undesirable associations. The new ‘Chapters’ provided in this Planning Permission in Principle’ portions of this application seek to replace the existing agreed Masterplan. However this is lacking entirely in the coherence and detail of that Masterplan : replacing some attempt to design a community with isolated blocks of housing and resort developments. Following the 2011 Zit Award for Scotland's worst building to the Clubhouse in the Carbuncle Cup, it was to be hoped that the developer would have heeded the advice and avoid pastiche and worse. However this is not the case with the larger ancillary building such as the Lodges and Gym being repeats in design terms the faults of the Clubhouse and the ‘Town Hall’ hilariously impersonates a church. A referral to a Design Panel to review this lost opportunity would be appropriate. Permission for APP/2018/1814 should not be granted until the grade related junction at Orrock is constructed in accordance with the 2008 OPP and the 2017 Aberdeenshire Local Plan conditions. More footpaths and cycle paths will be required to improve access to local facilities especially parallel to the coast, other than the existing routes along the beach. This application should be rejected as it does not conform to the 2006 Outline Planning Permission nor the OP3 allocation in the 2017 Aberdeenshire Local Development Plan and would be significantly harmful to the integrity of the planning system, the good principles of design, involves damage to the environment including ancient woodland, and contains inadequate proposals relating to the required infrastructure to support a development of this scale and nature. In 2008, Scottish Ministers granted Outline Planning Permission (2006 OPP) for a Golf Resort at Menie after the initial refusal by Aberdeenshire Council. Importantly the significant breaches in Local and National Policy including the environmental damage the development would cause were considered to be outweighed by economic benefits of national importance. That led to strict phasing of the development to ensure that the mainstream housing element of the development, said by the applicant to be necessary to cross fund the resort, was delivered in phases as the resort was delivered. Details of phasing conditioned in the 2006 OPP are given in Appendix 1. To date, a portion of Phase 1 has been delivered: a golf course, a small clubhouse and Menie House and some Steadings have been converted into visitor accommodation. The applicants are now arguing that the scheme is unviable and will remain so unless they are permitted to build all 500 open market houses in advance of the rest of the development. In addition the proposal seeks to significantly alter the agreed Masterplan that was agreed in 2010. The 2010 Masterplan which presented a coherent vision for both the residential and resort elements of the proposed development is replaced in the Planning Permission in Principle portion of this application with ill defined ‘Chapters’. No justification is offered for this change. This peculiar hybrid application is very much to the applicants advantage : they have presented studies associated with the full planning permission for portions of the development, ignoring the much greater impacts of the whole resort which may result in a very piecemeal and poorly planned whole. · Contributions to Affordable housing. The proposal to permit all 500 open market housing to be built in advance of the rest of the resort, clearly removes any and all incentive for the developer to complete the resort. That means that the paltry economic benefit the resort is delivering (see Appendix 2) despite the significant environmental destruction will continue, possibly indefinitely. It is interesting to note that as recently as 2015, the applicant consulted on a larger development, ENQ/2015/0526 | Planning Permission in Principle for the Erection of 850 No. Residential Units, 1900 No. Leisure Accommodation Units with Ancillary Commercial Development, Land At Menie Estate Balmedie, clearly believing that this could be viable. The applicant in 2006-2008 oversold his proposal and sadly many decision makers were taken in. Hopefully decision makers will be less likely to view this proposal through rose tinted spectacles. And in addition there were claimed to be 6000 (man years) of construction jobs, often confused in the public mind with 6000 actual jobs. The applicant also claimed that the global brand would focus attention on the North East of Scotland and indeed the Trump name is well known. Unfortunately, the higher profile of Mr Trump has also highlighted the less savoury aspects of his character, leading many to regard him as now a toxic brand with cities around the world such as Toronto and his home town of New York at pains to remove the name from buildings and even the Trump Organisation itself rebranding its own developments. While Mr Trump undoubtedly has a base support willing to ignore his flaws, the ethos and characteristics of Mr Trump and indeed his children who now operate the business are increasingly at odds with Scottish sensibilities. This is undoubtably impacting he economic viability of Trump businesses. The resort as it stands is posting small operating profits but due to ‘Administrative and Management Charges’ amounting to around a third of turnover, the resort are posting losses and, of course, have not paid any tax beyond VAT and Payroll taxes (Appendix 2). It is difficult to reconcile these figures with the claim (Table 2.4) of 80 on site jobs being supported by this proposed development, which with the usual multiplier effect may then equate to 100 FTE jobs across Scotland (Table 2.6). The disparity is with TIGLS conflating construction jobs with permanent jobs associated with the operation of the resort. This is a habit that TIGLS developed when the resort was first mooted and they confused 6000 man years of construction jobs with continuing employment in order to exaggerate the impact of their proposal. I trust no-one will fall for this ploy again. To be fair, Table 2.11 of the Report gives 171 construction jobs, indicating that TIGLS anticipate this portion of the overall development to be delivered over 11.7 years which begs the question of when, if ever, TIGLS propose completing the resort elements that are supposed to deliver the economic bonanza which is supposed to be Aberdeen’s post oil future. The development of retail, spa, gym, and 100 bed spaces is claimed to add 80 FTE jobs at Menie which would bring the total jobs at the resort up to around 175, one-sixth of the 1080 promised in the original Economic Impact Study. to which TIGLS applies a multiplier to reach 100 jobs. Anyone who knows the area will dismiss the claim that employment in tourism in the immediate area (10km) has increased from 5% to 33% in from 2009 to 2016. It must be suspected that the BRES survey sample size is generating an artefact that the Trump Organisation are only too ready to report, alongside their selective reporting of other issues in the Economic Assessment. It should be noted that they do not submit the commissioned reports themselves. The claimed economic benefits do not justify the further erosion of good planning principles and policy and certainly do not justify setting aside the carefully considered and crafted phasing the 2006 outline planning application and its attendant conditions, recently confirmed in the 2017 Local Development Plan. While the applicants may claim that their development should simply be treated as a housing allocation in that plan, it is clear that the development was only included in the LDP due to the outline planning permission : the Local Development Plan must not be used as a backdoor to circumvent the critical terms of the 2006 Outline Planning Permission. The Transport assessment is limited to the 500 mainstream houses and 50 units of visitor accommodation that are the subject of detailed proposals in this hybrid application. It therefore fails to plan for the much larger resort development or for the possibility of major events being hosted at Menie. It could be of course that the ‘toxic Trump’ brand means that the promoters of this development have given up on all hope of hosting major events, with even iconic Turnberry impacted by the association. If this is the case, then the developer can have no objection to a condition preventing major events without specific permission. The Transport Assessment recognises that few amenities are within close proximity, the reason for community facilities including a general store forming part of the Phasing (Appendix 1).. The document seems to suggest that they expect people to walk or cycle to Balmedie to use amenities including general store, post office, library and school. This seems optimistic due to the distance – in excess of the maximum threshold of 1600m for walking (PAN 75 stated in para 2.1.8 of TA), and the lack of safe walking and cycling routes, not to mention the variety of normal weather conditions in NE Scotland. The proposed walking links via Balmedie Beach whilst suitable for leisure walking are not suitable for accessing Balmedie village amenities, especially at high tide. Access to and from the estate, on foot, by bicycle, should be provided with routes both parallel to the coast inland from the beach routes to complement Nortrail and provide access between the future settlement of Menie and Balmedie as well as across the estate from the old A90 to the beach. The ‘Chapters’ plans conspicuously do not plan for such access The proposal to provide of cycle lanes (4.3.6) is welcome and suggest this should be a condition if planning permission granted. This would also require speed limits and traffic calming measures along the old A90 route. Further exploration of developing a network of cycle routes to link to NCN1 and SUSTRANS cycle network would also be welcomed. The limited transport assessment accepts that the ‘main origin and destination of the bulk of the development trips will be to the south towards Aberdeen. Development traffic will therefore require to pass through Balmedie in order to reach the new Balmedie trunk road junction’. The original PPiP application was granted subject to the legal requirement in the Section 75 agreement and re-iterated in the current Aberdeenshire Local Plan that ‘a new grade separated junction in the vicinity of Orrock House’ would be required. The current TA replaces this condition with a roundabout onto the old A90. Yet clearly the construction of the flyover at Orrock was designed to accommodate a future grade related junction. Such a junction would allow all traffic for the new development to readily access the Menie Estate and would significantly reduce the adverse effect of increased traffic flows into and through Balmedie and facilitate an alternative route when accidents etc close part or all of the A90(T). Tables 5.1 and 5.2 appear to significantly underestimate the likely trip generation associated with the proposal at 562 AM and 509PM peak trips. There seem to be no figures given for traffic generated outwith peak hours – despite likely high numbers of private car journeys, deliveries, taxis etc. An equestrian Centre is also likely to generate increase traffic flows including horse boxes throughout the year, especially if it is expected to be a competition centre. Whilst setting out worthy aspirations, the notion that a residential travel pack will significantly reduce the number of car journeys appears extremely optimistic. While new residents may well attempt to take more exercise, they will still be reliant on motor vehicles for the bulk of their journeys. The proposed development is being clearly targeted at wealthy families with high car ownership rates and usage. There is no indication that electric vehicles are being encouraged or that residents will have car charging points. Bus operations in the vicinity are currently being reviewed after the opening of the A90(T) dual carriageway. The timetables mentioned in the Transport Assessment are therefore unlikely to continue with the probability being that Menie will end up with an approximate hourly service rather than continue to be served by multiple routes using the A90 corridor. Only a limited number of buses pass are expected to pass through Balmedie village, others have customarily by-passed Balmedie so going shopping by public transport for day-to-day supplies will be difficult by public transport. This will increase number of car journeys to Balmedie significantly. The OPP granted in 2008 and Section 75 agreements clearly state that the development of Menie requires the construction of a grade related junction onto the A90(T) at Orrock. The current Application seeks to side-step this important condition and to route development traffic along the old de-trunked A90. This is clearly unacceptable. The traffic flow data an which the TA is based appears to significantly under-estimate the likely number of vehicular trips associated with the proposed development. It should be noted that promised arrangements for access have not been fulfilled and access to the estate at various points (Leyton Cottage, Menie Lodge, etc) remain cut off and actively discouraged in contravention of the Land Reform Act (2003). The Estate needs reminded of its duties including to those with mobility impairments and the combination of locked gates and the deliberate placing of obstacles should not be continuing. Identified in the survey were internationally and nationally rare lichens: the habitat for these needs to be preserved not just the hosts. 1) The Menie Environmental Management Advisory Group (MEMAG) met infrequently and often TIGLS staff failed to attend. Its decisions were ignored. It has now ceased to meet and indeed TIGLS have asked for this requirement of the planning permissions to be rescinded. 2) Tom Dargie, the ecologist originally employed by Mr Trump as an advisor to the development of the golf course has stated that his advice was ignored by Mr Trump. 4) Mr Trump has made much of being a climate change denier, his scepticism of scientific evidence is also well reported across a broad spectrum of well-regarded media, including his legal challenges to the Aberdeen Offshore Wind Development. 5) Trump’s management style is to remove opposition. He has had the highest turnover of staff of all presidents for the past 100 years and one of the main reasons as found by the Washington based research group Brookings Institute was “However, record-setting turnover during Trump’s first year may be the result of at least two other unique factors. One factor was the president’s focus on loyalty over qualifications. Since the president relied on many of his connections in the private sector and was reluctant to hire those who opposed him during the campaign, the absence of prior White House experience among the ranks of the senior staff was glaring.” . We see this In the turnover of key personnel including golf course designers and ecological advisors at Menie. The environmental impact assessment appears to be very limited with many species that have been observed regularly by local residents and visitors, missing. To rely on the applicant to both accurately monitor and record the species and habitats present and put proper mechanisms in place to mitigate for habitat and biodiversity loss would be futile given their past record which shows that this is a low priority. There should be no loss of Ancient Woodland permitted as there is sufficient space to incorporate the housing elsewhere. The Trump Organisation have been caught using unauthorised standpipes in order to irrigate the grounds, even during this summer’s drought. They also have a history of a rather cavalier attitude to maintaining the private water supplies of properties that lie within the estate boundary. While it is recognised that these are private legal matters, the planning authority has a duty to ensure that mitigation measures are put in place to prevent adverse impacts on neighbouring properties where these can be predicted. 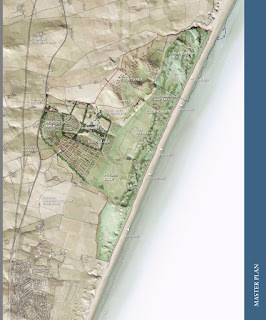 It should be noted that the resort developments for Phase 1 of the 2006 Outline Planning Permission were required to be linked to the Balmedie main sewerage system. They still rely on septic tanks. No further development should be permitted until this situation is regularised in line with the 2006 Outline Permission Section 75 agreement. In 2010 a Masterplan from Hoskins Architects adding detail to the 2006 Outline Planning Permission was agreed. 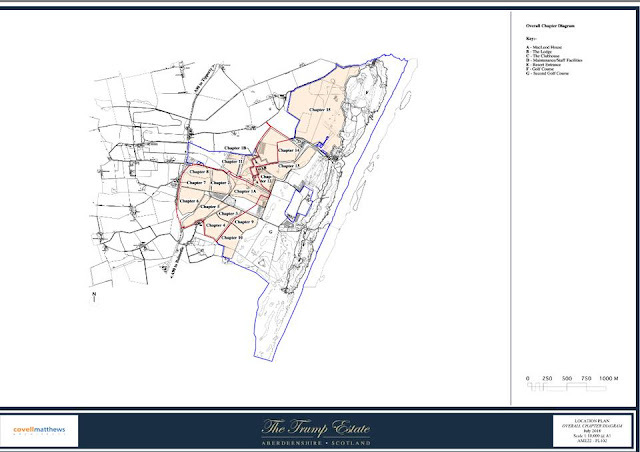 This Masterplan presented a coherent vision for the development with the creation of a residential core to the south and west of Menie House and the resort to the north. The Masterplan has been used to inform subsequent piecemeal planning applications for the conversion of Menie House into hotel accommodation, the Steadings into additional visitor rooms, the banqueting suite appended to Menie House, etc. This application seeks to replace that Masterplan with ‘Chapters’ of development without explaining any rationale for this, or detailing what each ‘Chapter’ entails. On the original plans, Menie House, then said to be intended as the private residence of the Trump family, was left with its curtilage more of less intact. Subsequently Menie House has been brought into the core of the resort, first by conversion to the hotel and service centre for the Steadings converted to accommodation and latterly by the now expired planning permission to append a Banqueting Suite onto it. It is to be hoped that the ‘Town Hall’ functionally replaces the banqueting suite. However, this proposal inserts development within the curtilage of Menie House significantly impacting this listed building. The setting of Menie House is however already compromised by alien elements such as the flagpole, artificial stone fountain and new access and parking areas. The submitted documents commit to some archaeological watching briefs where features of possible interest are known. This should be treated with a high degree of scepticism given the appalling record of MEMAG which was supposed to oversee the building and operation of the golf course but rarely met and proved entirely ineffective due to it entirely advisor status and the developers’ total lack of engagement.. In these circumstances, with a developer who appears intent on ignoring normal norms of behaviour, the imposition of advance trial digs in areas of interest would be appropriate. The Archaeological Desk-Based Assessment presents a detailed study of the effects of the proposed development on the known and potential archaeological and built heritage of the site. Amongst other things, the assessment identifies that 'there is a moderate to high probability of discovering buried archaeological remains within the proposed development site' and presents a draft 'Written Scheme of Investigation' (WSI) detailing archaeological trial trenching evaluation of the site to be conducted prior to commencement of development works, and subject to approval by Aberdeenshire Council. This is welcome, but needs to be rigorously monitored, by an agency independent of the Trump Organisation given their appalling history of ignoring advice. The Assessment also identifies that 'The introduction of the two proposed new eight bedroom lodges, immediately to the north of Menie House, would appreciably change its current setting'...' resulting in a moderate adverse effect'. However there is no mitigation proposed, and no justification for the siting of the lodges in that location is given in the development proposals, nor consideration of alternative locations. The WSI refers to the APP/2010/0423 approved masterplan, but overlooks the fact that it does not show any new buildings in the vicinity of Category B listed Menie House. Aberdeenshire Local Development Plan (2017) Policy HE1: states that: 'We will not allow development that would have a negative effect on the character, integrity or setting of listed buildings, or scheduled monuments, or other archaeological sites'. Permission to erect the two lodges in that location should therefore be refused. The Landscape Assessment provides scant evidence for its conclusions and lacks a rigorous approach to identifying receptors and assessing impacts from those points. The Assessment admits that further work is necessary and this is reinforced by the proposals for significant removal of tree belts and areas of woodland and the unnecessary increase in densities of development particularly impacting Menie House. Illustrative of views from old A90, the first expansive views of the coast north of Aberdeen. “The building was designed by Huntly architects Acanthus df, who in the past have turned out some very fine buildings. If one is to design a pastiche of an historic building then at the very least it needs to be true to the scale, style and proportion of the period – this building is none of those. With the Menie Estate’s location within a landscape of heroic importance, Acanthus have a duty to society, the environment & their profession to produce a building that befits such a wonderful and unique setting. “By producing this third rate building a golden opportunity has been lost to create a sublimely elegant, understated, contemporary building that could have been a beacon for the best that Scottish Architecture. We have the talent – what a shame it was not utilised in this instance. The developers and the architect, now under the name CovellMathews, seem to have learnt no lessons from this with e.g. the Lodges and Gym echoing the derisible Clubhouse. The ‘Town Hall’. possibly intended to replace the banqueting suite attached to Menie House for which permission has mercifully lapsed, impersonates a church. There seems to be a substitution of ornamentation for design with even simple structures such as garages requiring no less than 5 external finishes. A full review of the designs proposed would be appropriate given the eventual scale of this development. Design is not merely a matter of taste but can root a place in the landscape, both physical and cultural and engender a sense of place. 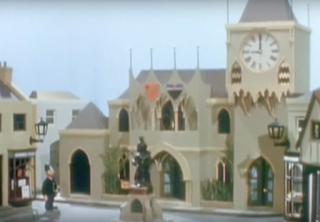 At present the Trumpton cartoon seem to be as much a source of inspiration than Aberdeenshire and references to e.g. Monymusk are merely insulting. ‘hotel’ elements such as Gym, retail. Expansion of sewage works in Balmedie. New or extended bus services. Primary school and associated facilities to accommodate 225 pupils. Grade separated junction onto A90 (T). The actual performance of TIGLS against that is not encouraging. TIGLS has made a loss of around a third to a half of its turnover each year it has been open, albeit that is largely fuelled by the ‘Administration and Management Charges’. One can only suspect are a device to transfer profits when these are eventually made outside of the UK as no sensible business incurs such high charges against such a modest turnover. I am happy to address most contributions if they are coherent. Comments with a constructive contribution to make to the discussion, even if it is critical will be posted. Please do not add comments in the name of real people unless you are that person. The views expressed in comments are those of the poster, not me. I am a political campaigner and planner based in Aberdeenshire. I'll blog here on a range of issues that interest me. It's likely to be erratic. website of wilderness hiker, backpacker, author and broadcaster Cameron McNeish. This blog is published by Debra Storr using facilities provided free of charge at www.blogger.com. The main posts are my opinions: comments are the responsibility of the posters of the comments. Occasionally, I invite Guest Blogs : their opinions are, of course, their own.